As the quest for great doughnuts here in NYC continues I bring you a new addition to the list. 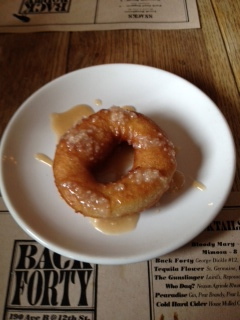 At a recent brunch at Back Forty I was very happy to discover that they offer a doughnut on weekends. The flavors rotate and the one on offer the day I was there was a Chai doughnut. The doughnut itself runs closer to fried dough or a zeppoli than your standard cake doughnut. It is thin with a crispy crust and warm, chewy interior. It is delicious, and I promise you it is better than anything you will get at a street fair on Third Avenue. As for the topping, rather than a standard glaze spread on top, a warm Chai syrup was poured over doughnut. It was sticky and sweet, with a wonderful blend of Chai spices that balanced the sugar. Familiar and unique at the same time, this is globe-trotting comfort food. Back Forty is always worth a visit for brunch. Their doughnut just seals the deal. And with news that Back Forty West is opening in the old Savoy space, and serving breakfast, here is hoping doughnuts are at the top of their menu. Fingers crossed. Hello guys if you are really wants to play free online games then here on just single click on our website you will play https://solitaire-klondike.net game this is the multiplayer card game which you love to play online on your pc tablet and smartphone their is no any download and registration required to play this game this is the multi player card game you love to play this games once for better gaming experience the goal of the game is to sorts the card from the deck ofshuffled card and have to set them in ascending order in four rows.